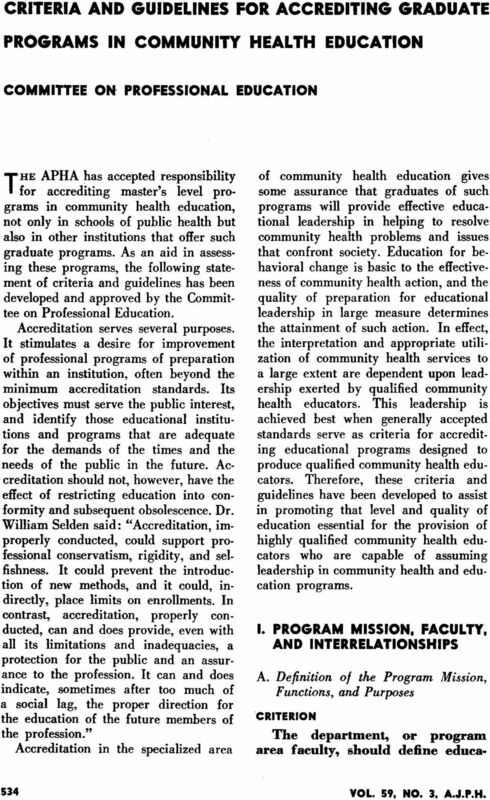 Download "Tfor accrediting master's level programs"
1 CRITERIA AND GUIDELINES FOR ACCREDITING GRADUATE PROGRAMS IN COMMUNITY HEALTH EDUCATION COMMITTEE ON PROFESSIONAL EDUCATION THE APHA has accepted responsibility Tfor accrediting master's level programs in community health education, not only in schools of public health but also in other institutions that offer such graduate programs. As an aid in assessing these programs, the following statement of criteria and guidelines has been developed and approved by the Committee on Professional Education. Accreditation serves several purposes. It stimulates a desire for improvement of professional programs of preparation within an institution, often beyond the minimum accreditation standards. Its objectives must serve the public interest, and identify those educational institutions and programs that are adequate for the demands of the times and the needs of the public in the future. Accreditation should not, however, have the effect of restricting education into conformity and subsequent obsolescence. Dr. William Selden said: "Accreditation, improperly conducted, could support professional conservatism, rigidity, and selfishness. It could prevent the introduction of new methods, and it could, indirectly, place limits on enrollments. In contrast, accreditation, properly conducted, can and does provide, even with all its limitations and inadequacies, a protection for the public and an assurance to the profession. It can and does indicate, sometimes after too much of a social lag, the proper direction for the education of the future members of the profession." Accreditation in the specialized area of community health education gives some assurance that graduates of such programs will provide effective educational leadership in helping to resolve community health problems and issues that confront society. Education for behavioral change is basic to the effectiveness of community health action, and the quality of preparation for educational leadership in large measure determines the attainment of such action. 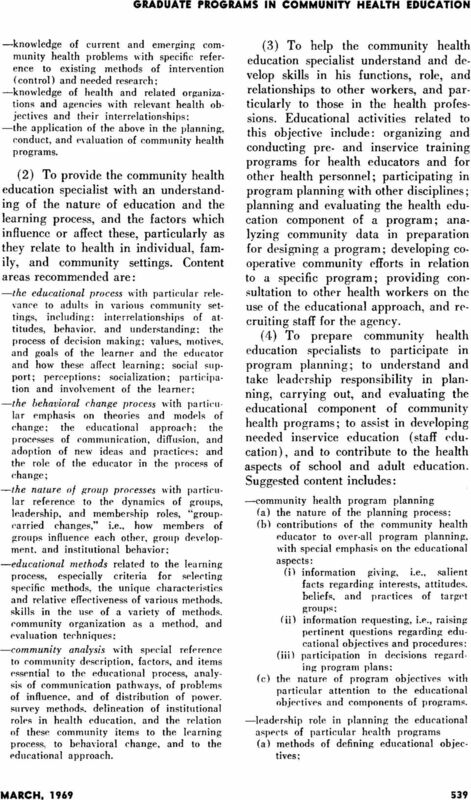 In effect, the interpretation and appropriate utilization of community health services to a large extent are dependent upon leadership exerted by qualified community health educators. This leadership is achieved best when generally accepted standards serve as criteria for accrediting educational programs designed to produce qualified community health educators. Therefore, these criteria and guidelines have been developed to assist in promoting that level and quality of education essential for the provision of highly qualified community health educators who are capable of assuming leadership in community health and education programs. 1. PROGRAM MISSION, FACULTY, AND INTERRELATIONSHIPS A. Definition of the Program Mission, Functions, and Purposes The department, or program area faculty, should define educa- S34 VOL. 59, NO. 3. A.J.P.H. 3 actions between faculty and students and between the different faculty disciplines in order to obviate the disadvantages of utilizing parttime faculty members. 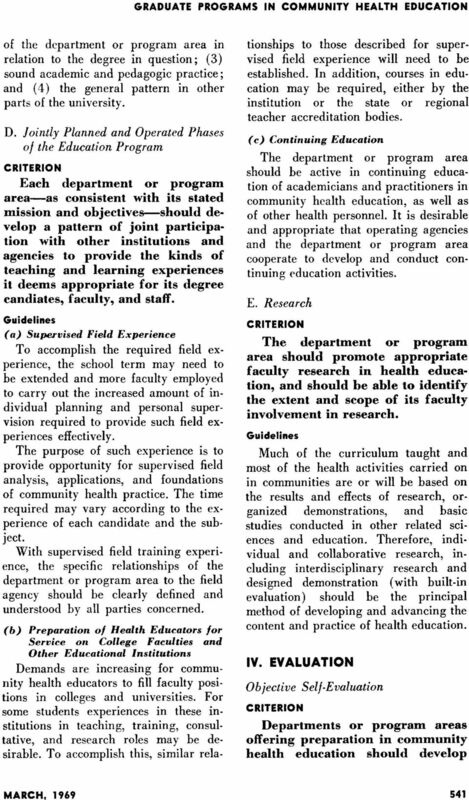 (e) Other members of the faculty who teach community health education eourses should have specific experience and academic qualifications in this special field. (f) The faculty should be large enough in relation to enrollments and programs to establish a facultystudent ratio recommended in and commensurate with acceptable standards for other graduate programs. 2. The department or program area should develop and maintain appropriate cooperative and joint relationships within the college or university, as well as with outside educational and service agencies. 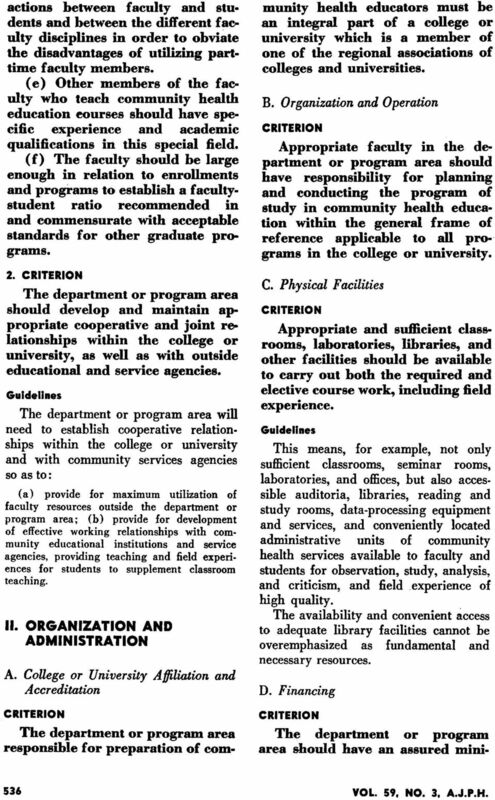 The department or program area will need to establish cooperative relationships within the college or university and with community services agencies so as to: (a) provide for maximum utilization of faculty resources outside the department or program area; (b) provide for development of effective working relationships with community educational institutions and service agencies, providing teaching and field experiences for students to supplement classroom teaching. II. ORGANIZATION AND ADMINISTRATION A. College or University Affiliation and Accreditation The department or program area responsible for preparation of community health educators must be an integral part of a college or university which is a member of one of the regional associations of colleges and universities. B. Organization and Operation Appropriate faculty in the department or program area should have responsibility for planning and conducting the program of study in community health education within the general frame of reference applicable to all programs in the college or university. C. Physical Facilities Appropriate and sufficient classrooms, laboratories, libraries, and other facilities should be available to carry out both the required and elective course work, including field experience. This means, for example, not only sufficient classrooms, seminar rooms, laboratories, and offices, but also accessible auditoria, libraries, reading and study rooms, data-processing equipment and services, and conveniently located administrative units of community health services available to faculty and students for observation, study, analysis, and criticism, and field experience of high quality. The availability and convenient access to adequate library facilities cannot be overemphasized as fundamental and necessary resources. 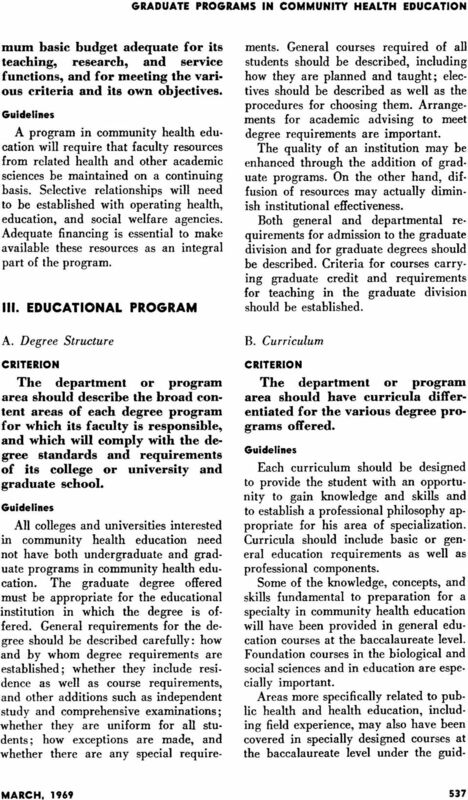 D. Financing The department or program area should have an assured mini- 536 VOL. 59, NO. 3. A.J.P.H. 5 ance of faculty qualified in public health and community health education. Areas of knowledge, concepts, and skills required for the master's degree include some offered at the baccalaureate level, but such areas should be considered in greater depth and breadth at the master's level. Additional areas of study include research and theory underlying health education practice. Emphasis is placed on development of analytical and creative abilities needed to determine the educational components of health programs, the factors and methods to be considered in achieving educational goals, and the ways of evaluating programs. The master's level of preparation should prepare the student to assume leadership responsibilities in supervision, consultation, and administration. If experience has not been a requirement at the bachelor's level, it should be included at the master's level. Well-defined, supervised field experiences should supplement theoretical instruction. C. Admission and Degree Requirements Each department or program area should enforce appropriate admission requirements that conform to the standards of its college or university, and that will insure the realization of its own stated mission, purposes, and objectives. a. Admission Requirements - Master's Degree Admission requirements to programs of study for the preparation of community health educators at the master's level include a bachelor's degree from an acceptable institution in addition to appropriate preparation in areas of knowledge, concepts, and skills pertaining to community health education, including preparation in selected biological and social sciences and in psychological and sociological foundations of education. b. Degree Requirements-Master's Degree The program should include courses concerned with an orientation of the student to community health concepts and practices in general, and an introduction to public health sciences in particular. In addition, a student should fulfill other requirements equivalent to those required of candidates for similar master's degree programs in other parts of the university. 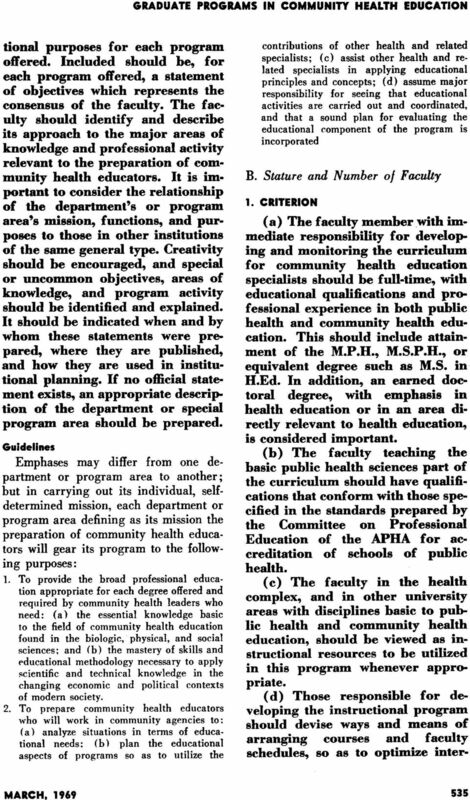 The fields of instruction to be attained or competence to be demonstrated at the master's degree level for community health educators before the degree is awarded are related to the following objectives. (1) To provide the community health education specialist with an understanding of health functions, organization, and practices, and with knowledge and skills related to health services and goals. Content areas recommended to achieve this objective should stress instruction in selected fields basic to public health. These should include the following fundamental areas of knowledge: -the nature of man and his total environment (physical and bio-social), and his interaction with this environment as it affects his health; -the basic techniques of investigation, measurement, and evaluation, including biostatistics and epidemiology as a means of determining community health needs, programs, and progress; -the basic techniques of administration (organization and management), particularly as applicable to comprehensive health programs; -the economic, political, legal, cultural, and social dimensions and forces of the community as they relate to health programs and services; the techniques of describing and analyzing these dimensions and forces; 538 VOL. 59, NO. 3. A.J.P.H. 7 (b) analysis of forces and factors likely to affect change of behavior in practice; (c) analysis of characteristics of target groups; (d) designs for educational programs; (e) designs for evaluation procedures, particularly as they relate to modification in behavior, changes in beliefs, and measurement of levels of knowledge and understanding of target groups; (f) methods of community analysis to identify communication patterns, leadership, and decision-making mechanisms in families and community groups. 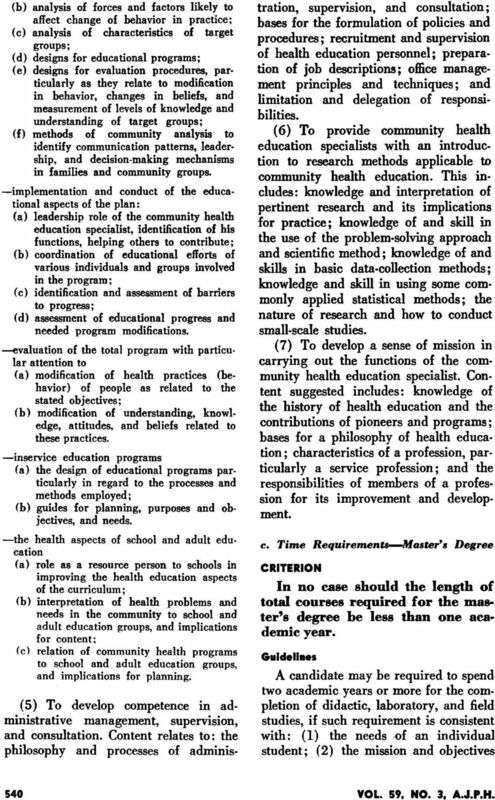 -implementation and conduct of the educational aspects of the plan: (a) leadership role of the community health education specialist, identification of his functions, helping others to contribute; (b) coordination of educational efforts of various individuals and groups involved in the program; (c) identification and assessment of barriers to progress; (d) assessment of educational progress and needed program modifications. -evaluation of the total program with particular attention to (a) modification of health practices (behavior) of people as related to the stated objectives; (b) modification of understanding, knowledge, attitudes, and beliefs related to these practices. -inservice education programs (a) the design of educational programs particularly in regard to the processes and methods employed; (b) guides for planning, purposes and objectives, and needs. -the health aspects of school and adult education (a) role as a resource person to schools in improving the health education aspects of the curriculum; (b) interpretation of health problems and needs in the community to school and adult education groups, and implications for content; (c) relation of community health programs to school and adult education groups, and implications for planning. 540 (5) To develop competence in administrative management, supervision, and consultation. Content relates to: the philosophy and processes of administration, supervision, and consultation; bases for the formulation of policies and procedures; recruitment and supervision of health education personnel; preparation of job descriptions; office management principles and techniques; and limitation and delegation of responsibilities. (6) To provide community health education specialists with an introduction to research methods applicable to community health education. This includes: knowledge and interpretation of pertinent research and its implications for practice; knowledge of and skill in the use of the problem-solving approach and scientific method; knowledge of and skills in basic data-collection methods; knowledge and skill in using some commonly applied statistical methods; the nature of research and how to conduct small-scale studies. (7) To develop a sense of mission in carrying out the functions of the community health education specialist. 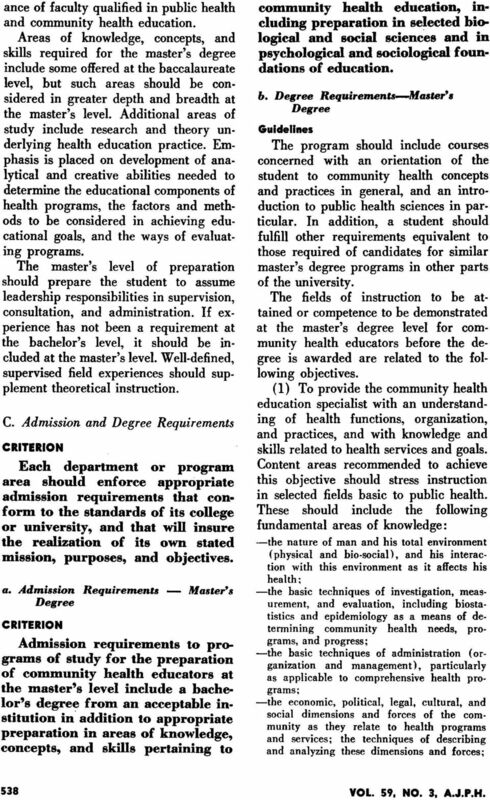 Content suggested includes: knowledge of the history of health education and the contributions of pioneers and programs; bases for a philosophy of health education; characteristics of a profession, particularly a service profession; and the responsibilities of members of a profession for its improvement and development. c. Time Requirements-Master's Degree In no case should the length of total courses required for the master's degree be less than one academic year. A candidate may be required to spend two academic years or more for the completion of didactic, laboratory, and field studies, if such requirement is consistent with: (1) the needs of an individual student; (2) the mission and objectives VOL. 59. NO. 3. A.J.P.H. 9 various approaches to self-evaluation. Attempts at self-evaluation of department or program progress and success should be undertaken with as much objectivity as possible, keeping in mind its stated mission, objectives, and purposes. Success should be acknowledged by the accomplishments of its faculty and by the careers of its graduates, as demonstrated in service, publications, and research. 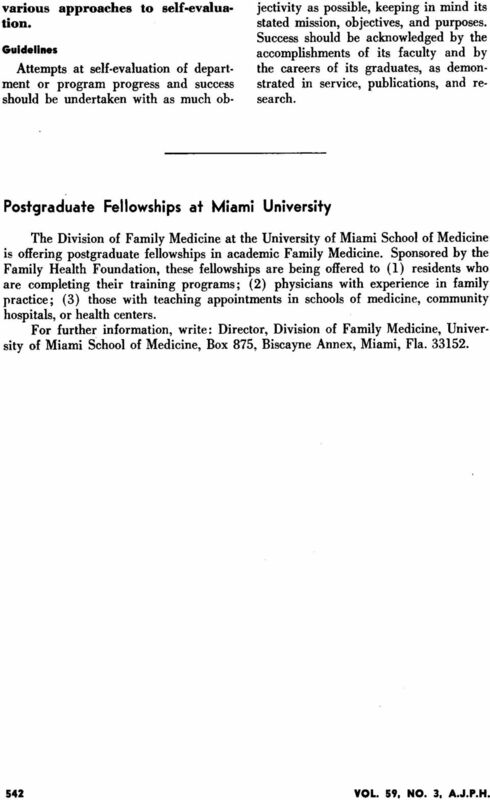 Postgraduate Fellowships at Miami University The Division of Family Medicine at the University of Miami School of Medicine is offering postgraduate fellowships in academic Family Medicine. Sponsored by the Family Health Foundation, these fellowships are being offered to (1) residents who are completing their training programs; (2) physicians with experience in family practice; (3) those with teaching appointments in schools of medicine, community hospitals, or health centers. For further information, write: Director, Division of Family Medicine, University of Miami School of Medicine, Box 875, Biscayne Annex, Miami, Fla VOL. 59, NO. 3, A.J.P.H. CEPH Criteria, Interpretations and Documentation 1.0 The School of Public Health 1.1 Mission. The school shall have a clearly formulated and publicly stated mission with supporting goals and objectives.